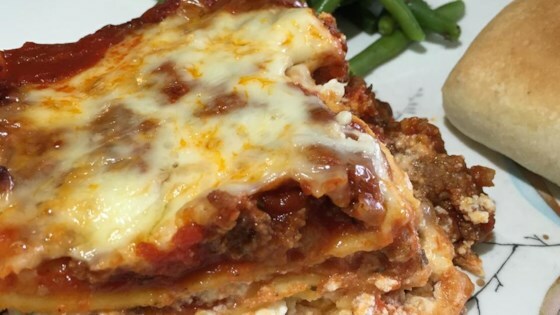 "Make this classic lasagna recipe zestier by using hot Italian sausage or a little milder with regular Italian sausage. Don't be scared off by the long cooking time. The wait is well worth it. It's a great dish to make for a crowd and easy to adjust for varying tastes. The leftovers are even better when reheated the next day." Bring a large pot of lightly salted water to a boil. Add the lasagna noodles and olive oil; cook until al dente, 8 to 10 minutes; drain. Cook the ground beef and sausage in a large pot over medium heat; drain. Stir in the mushrooms, garlic salt, oregano, thyme, basil, and tomato sauce. Season with salt and pepper; simmer 30 minutes. Meanwhile, mix together the ricotta cheese, eggs, and Parmesan cheese in a bowl. Ladle enough of the meat sauce into a 9x13 inch baking dish to cover the bottom in a thin layer. Form a layer atop the sauce with 3 of the lasagna noodles. Spread about 1/4 of the ricotta cheese mixture over the noodles. Sprinkle about 1/3 of the mozzarella cheese over the ricotta cheese mixture and then ladle about 1/3 of the meat sauce over the mozzarella cheese. Repeat layering twice more, topping with the remaining 1/4 pound of mozzarella cheese. Bake in preheated oven 90 minutes. Allow to sit 10 to 15 minutes before serving. This recipes is really good, except do not add the final layer of mozzarella until the very end, otherwise it ends up burnt to a crisp! haha whoops! Otherwise, very delicious. As good as any I have ever had! The only thing I changed was to use two jars of prepared sauce instead of messing with making my own. Had to give it 5 stars. Really good! Good stuff, but take the time to make homemade sauce. I used fresh tomatoes and replaced the beef/sausage with ground turkey. Yum! VERY good. Didn't have large enough dish for all the layers. Only cooked for 1 hr, plenty of time.